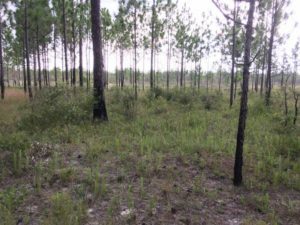 In the Florida panhandle, Enviva’s sourcing is proving to be a helpful conservation tool in restoring longleaf pine forests, which can be one of the most biodiverse forest types in North America. As a type of pine savanna, well-managed longleaf forests harbor many plant and animal species because their widely spaced trees let sunlight support a flourishing, ground-level plant community. Longleaf forests were once one of the major forest types in the region, covering over 90 million acres in the Southeast United States, but now only about 4 million acres of longleaf forests remain. 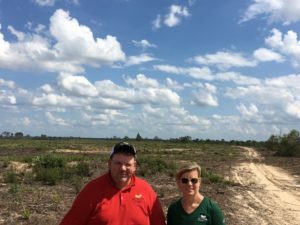 Restoring 8 million acres of longleaf within 15 years is the focus of a concerted regional effort involving landowners, foresters, nonprofits, and state and federal agencies. East of our Cottondale plant Enviva foresters and contractors are helping prepare 140 acres at Torreya State Park for longleaf restoration. The first step of restoration is removing brush and small-diameter trees, mostly sand pine but also some species of hardwoods. Chipping these materials to make pellets has compelling advantages over conventional logging, which became obvious during a recent visit to the Park with Enviva Chief Sustainability Officer Jennifer Jenkins and Sustainability Forester Shawn Cook. On one side of the logging road, Enviva’s contractor had microchipped the brush and small trees, leaving the site cleared of residues and nearly ready to plant, with only minor site preparation left to do. A few live oak and other hardwood trees, which Florida Park Service Biologists marked for the loggers to leave for wildlife. The chipping operation didn’t noticeably disturb the soil. Enviva Sustainability Forester Shawn Cook is rightly proud of how Enviva’s purchasing practices can enable restoration: “By microchipping tracts like this, most of the fiber is utilized and site prep costs are drastically reduced, making restoration projects more feasible for the landowner,” says Cook. On the other side of the road, the logging site was a different scene altogether. During the conventional logging job, the sand pines had been harvested for pulp, but because there was no market for tree limbs and tops (so-called “slash”) or for the brush, the loggers had to come back with bulldozers to clear it into long windrows, which were often over 6 feet tall. Using dozers to prepare tracts for planting is expensive, and it’s also hard on the soil because it rips up the plant community. This type of microchip harvesting also has the advantage of reducing carbon emissions. Before replanting a traditionally logged site with longleaf pines, the piles of slash and brush have to be burned. Burning logging residues releases all of their carbon, but displaces no fossil fuels. Open burning of slash also creates much dirtier smoke than controlled combustion at power plants. Pictured above: a young longleaf pine stand near Torreya State Park. State park officials now agree. Going forward, harvesting using a microchipper will be the preferred method to prepare sites for longleaf restoration. Each year for the next 10 years, Torreya State Park will restore 200-300 acres of longleaf, which will add to the landscape-scale longleaf mosaic in the nearby Apalachicola National Forest and Nature Conservancy longleaf tracts. Enviva is proud to work with state and federal agencies, nonprofits, and public and private land managers, where microchip harvesting can assist their restoration efforts.